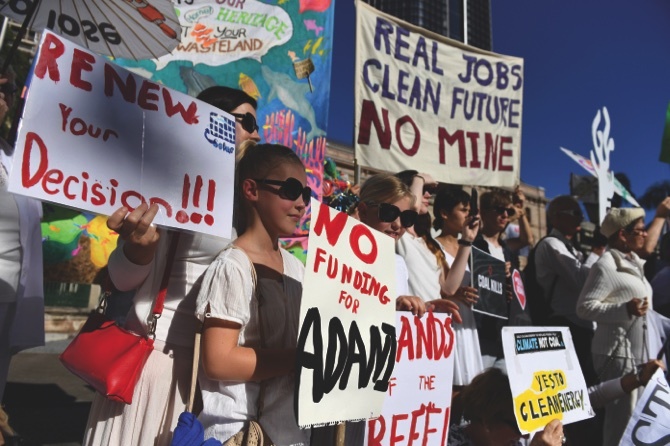 But the Carmichael coal project, a massive 22 billion Australian dollar (USD16.5 billion) mine that Indian resource billionaire Gautam Adani hopes to start work on this year in the remote Galilee Basin, has created an extraordinary clash between the resource and environment sectors. Those concerned by the environmental cost of the colossal development are particularly irked that federal and state governments have considered subsidizing Adani’s entry into an already-crowded Australian coal mining industry. Adani boasts that the mine will generate power for 100 million Indians, while providing Queensland with 10,000 jobs plus $22 billion in mining tax and royalties revenue within 30 years. “This will assist much needed public funding to help deliver schools, hospitals, roads and other services and stimulating activity throughout the economy,” an Adani statement said. A study of coral bleaching on the reef, published in the journal Nature in March, focused international attention on the devastation to coral expanses dealt by rising ocean temperatures off Australia’s coast. Researchers found 91 percent of the 2,300-kilometer Great Barrier Reef had been bleached at least once during three bleaching events of the past two decades, the most serious event occurring last year. The government authority in charge of the reef marine park reported to a Senate committee in May that as much as half of the 344,000 square kilometers of coral might already be dead due to bleaching. “This has happened because of global warming. We burned too many fossil fuels and might have lost half the reef,” said Sam Regester, campaign director of the activist organization GetUp. Some are concerned that the Adani mine will further damage the World Heritage-listed reef through dredging at its port at Abbot Point at the south end of the coral, dust contamination of its waters or through increased coal-carrier traffic with all its inherent risks. But opponents argue the main threat to the reef isn’t posed by the mine’s proximity. They blame the sheer mass of warming carbon gases that it could unleash into the atmosphere. The latest reef report by Climate Council, an independent think tank, said Carmichael would become Australia’s largest coal mine and would have a potential lifetime of 25 to 60 years. Burning all of the coal in the Galilee Basin would release an estimated 705 million metric tons of carbon dioxide each year — more than 1.3 times Australia’s current annual emissions from all sources. Australian Conservation Foundation, an independent environmental group, last year launched an unsuccessful court challenge to the federal government’s approval under environmental law for the mine to go ahead. The foundation had argued that the government failed to fully consider the impact of coal burnt in India on the reef. The government argued that the same amount of coal could still be mined somewhere else in the world if Carmichael did not proceed. The foundation appealed their loss in March and is waiting for the full bench of the Federal Court to make its ruling. The mine is an integral part of what Adani calls its pit-to-plug model. Carmichael coal would be shipped to Adani power stations in the Indian cities of Mundra and Udupi in a supply chain that would insulate the company from global price fluctuations. The project faces obstacles and skepticism on multiple fronts. Australia’s second largest bank, Westpac, in April effectively ruled out financing the mine by adopting a new climate change policy. Westpac became the 19th bank around the world to either distance itself publicly from Galilee Basin coal export projects, or introduce policies that prohibit financing the Carmichael mine. Westpac will lend only to mines extracting coal that ranks in the world’s top 15 percent for energy content. High-energy coal contains less sulfur, ash and other impurities, burns cleaner and is regarded as better for the environment. While the Galilee Basin won’t produce coal of a standard as high as Australia’s Hunter Valley, Adani, a Westpac client, argues that the Carmichael mine will export higher quality coal than is produced by India and Indonesia. That Indian and Indonesian coal could fill the void if Carmichael coal stayed in the ground. Westpac’s new policy also restricts investment to existing coal-producing basins. Carmichael, a series of around a dozen underground mines and open-cut pits, would be the first mine in the Galilee Basin. Other major Australian banks had previously distanced themselves from Adani or have announced they are winding down investment in coal, which after iron ore is Australia’smost lucrative export. Adani has promised thousands of jobs and investment in an Australian economy struggling to recover from a mining investment boom that has passed. While many question the economics of the Carmichael mine in an increasingly coal-averse global market, Adani enjoys strong government support. Federal government plans to amend native title laws to give legal certainty to Adani’s agreement with local Aborigines to mine their ancestral lands. A court ruling in February created doubt about the legality of more than 100 native title land use agreements, including Adani’s. But the company still faces a potential court battle against a minority of traditional owners who oppose the mine on the grounds that it would destroy their land and groundwater. The federal government is also considering providing Adani with a AUD900 million concessional loan to build a 388-kilometer rail line from the mine to the Abbot Point coal-loading terminal. The money would come from the Northern Australia Infrastructure Facility, set up last year to encourage private investment in infrastructure that would benefit Australia’s sparsely populated tropics. The Adani board was to have made a final investment decision on the project this week. But that decision was postponed indefinitely due to uncertainty over how much the Queensland government intended to tax Adani for the coal it extracted, the company’s spokesman said. “We want to start letting contracts, and we can’t do that without knowing what costs are being incurred,” Adani Australia spokesman Ron Watson said. Media reports that the state leader had offered Adani a “royalty holiday” — an initial period in which the company would pay no state royalties on the coal exported and potentially cost the state hundreds of millions of dollars in lost revenue— sparked government infighting. But within two days of the cancelled board meeting, Adani and the government confirmed that they had struck deal that allowed the company to defer royalty payments. “Every cent of royalties will be paid and any deferred royalties will be paid with interest,” Queensland Premier Annastacia Palaszczuk said in a statement on Wednesday. Adani said its final investment decision will be made at the next board meeting. No date had been set, but the board usually meets monthly. “The royalties arrangement means the project is back on track to generate 10,000 direct and indirect jobs in regional Queensland,” an Adani statement said. A poll commissioned by The Australia Institute, an anti-coal think tank, found that 59 percent of respondents in Queensland state opposed Adani receiving any government subsidies, while 19 percent supported such financial help.